The Asian Producers’ Platform Camp (APPCAMP) took place in Seoul, Korea, on 1–6 December 2014. Melbourne-based writer and artist Urszula Dawkins attended APPCAMP as an observer. What follows is her Diary of the event. December 1 was an auspicious day: Seoul’s first winter snow fell. It descended on Marronnier Park in exuberant flurries and tapped at the windows of the ARKO Arts Theater, in Seoul’s Daehakro Daehangno district. In a rooftop rehearsal studio, some 30 Asian creative producers and sundry organisers and observers from the region swapped their boots for slippers, ahead of a week of research, skills exchange and networking at the first Asian Producers’ Platform Camp (APPCAMP). The camp, an initiative organised by the Steering Committee for the Producer (South Korea), Performing Arts Alliance (Taiwan), ON-PAM Open Network for Performing Arts Management (Japan), Performing Lines (Australia) and Live Performance Australia, was hosted by Arts Council Korea and the Steering Committee and supported by Arts Council Korea, Japan Foundation and the National Culture and Arts Foundation, in Association with Arts Council Korea-Performing Arts Center. APPCAMP aims to foster a strong network of Asian performing arts producers, developing work and sharing cultural knowledge across the region. The facts: five producers are here from each of four core countries: Korea, Japan, Taiwan and Australia. Pending funding, the core group will stay constant for three further annual APPCAMPs. Also here are eight producers from other countries, this year including China, Hong Kong, Singapore, Macau, Indonesia and Malaysia. The focus is on independent producers but the mix is broad, including participants from small and large arts companies, government projects and festivals. Many have not worked internationally before. Many have. Some are already collaborating across the region. So there’s a real cross-section of producing models and environments. The vibe: friendly! The morning is spent getting to know each other: we play a kind of clowning game; we gaze eye to eye; we tell personal stories in small groups; we line up in order of whose hands are warmest. The kind of thing, says one producer, that they are used to making their artists do! After two hours we’ve made friends, scattered around the studio floor tucking into a delicious packed lunch, with the snow still swirling energetically outside. In the afternoon each producer outlines their practice, their interests and the creative landscape they work in. These range from organisations like Seoul’s Marginal Theatre Festival to Hong Kong’s burgeoning West Kowloon Cultural District; from ‘robot theatre’ (Seinendan Theatre, Japan) to a Korean non-profit street festival called Funny Revenge to the Boring World. Friendships, say the organisers, are at the heart of APPCAMP: although driven and supported by several organisations, the Camp grew from personal connections between key members of these organisations who had long wanted to see a producer network in Asia to complement existing major arts centre and festival networks. Both Performing Lines’ Fenn Gordon and Kyu Choi of the Steering Committee for the Producer hope friendships will develop alongside APPCAMP’s professional gains—hence the retention of the core group over four years. They stress the significance of APPCAMP as an independently driven network—a less common structure in Asia than in Australia—in terms of potentially nurturing creative projects that may not emerge under existing government or market-driven programs. In the afternoon, guest speakers present a thorough outline of Korean arts policy and funding structures and participants compare the local situation with those of other Asian countries. With strongly government-driven arts sectors in Korea, Taiwan and Japan especially, questions arise: what creative niches can be identified and developed by independent, internationally focused producers outside the remit of departments of culture and foreign affairs? How can producers operating in less well-funded arts sectors—those of Malaysia and Indonesia, for example—meet the challenge of financing creative projects when funding is often restricted to major institutions and flagship national companies? The multi-skilling of the creative producer is a recurring theme. Producers ‘do everything,’ combining diverse skills with supportiveness, flexibility and ‘gut feeling.’ In the context of current Asian arts policies, it seems these diverse and ‘shape-shifting’ abilities might enable independent producers to both successfully exploit existing opportunities and to create new ones, catalysed by a growing understanding of each other’s cultures and challenges. Mid-week, APPCAMP’s pace is shifting—first-up we meet at a cosy basement café, Radio M; then after lunch head to the Seongdong district’s über-cool Veranda Industrial Studio—a renovated warehouse venue whose exposed brick walls are sparsely decorated with hip ‘found’ objects and typographic art. Far from chilling out, though, it’s here that Campers delve more vigorously into what brings the group together. What is ‘Asia’ anyway? What do producers in the region need? And how can they collaborate? Australians are used to the guilty feeling of knowing more about European than we do about Asian arts, but as Kyu Choi points out, it turns out that most participants—not just the Australians—admit to having little knowledge of the arts beyond their own countries. So what’s needed, then, is to know each other better, culturally and individually. Also discussed is the need to work through cultural and language differences by allowing extra time in international collaborations—this alongside building independent, conceptually driven, nimble and responsive networks. Independence is stressed: for participants it means free and open communication, lighter structures, reduced bureaucratic engagement and, importantly, ‘room to fail’—essential for testing new ideas and presentation forms. Throughout the Camp participants have lived in five traditional Korean houses, with each house ‘group’ undertaking research for presentation to the Camp. Living in close quarters is intense, but in Kyu Choi’s words “more Asian”—true to the philosophy of meeting on one another’s cultural ground. On Thursday, Campers take their research to the streets and meet local artists and producers, gaining a close-up view of Seoul’s performing arts scene. Having already met many local artists at Wednesday night’s networking party and attended performances on other nights, they wrap up the research day at a second party, this time joined by Seoul’s Daehakro Arts Ecology Project—a cross-artform network of some 28 members established to promote open collaboration and experimentation. Of the research presented and then developed into broader discussion in Friday’s Open Talk session—also including invited local artists and producers—the topic dubbed Traditional vs Contemporary explored especially rich territory. While marketing strategies might favour clear distinctions between ‘traditional’ and ‘contemporary’ arts—especially in international touring—the reality in Asia (including Australia) is more complex. Traditional forms such as Chinese opera continue to evolve and be ‘renewed’ in contemporary productions, while some Asian artists are highly trained in European theatre forms before learning the ‘traditional’ techniques that are assumed to be their ‘first language.’ The colonial legacy also clouds the notion of ‘tradition.’ Hong Kong Campers, for example, commented that in fact they are currently in search of their tradition. Funding is often ‘tradition-friendly,’ it was noted—and exoticism sells tickets. But how to successfully market work internationally without resorting to exoticism? Attracting audience ‘curiosity’ was proposed as an alternative, potentially developing new audiences without relying on stereotypes or sensationalism. Research exploring local Place/Space/Community was also illuminating, although time limits precluded deep discussion. The phenomenon of ‘creatives’ moving into and reviving depressed urban areas is familiar, but researchers presented a vivid picture of Seoul’s Itaewon district renewal following an influx of artists committed to preserving the area’s unique qualities—aiming not only to resist commercial re-development but also to strongly engage the area’s existing community. The Crossing Usadanro project specifically proposes “collectivism as a new form of urbanism,” offering an artist-led urban strategy as an alternative to outside investment and gentrification. Ambitiously outlined in a brochure styled to rival those of slick developers, Crossing Usadanro suggests the potential of creatively focused producers to play significant roles in both the arts ecosystem and the broader social landscape. As APPCAMP wound up, participants tabled some concrete initiatives, including an agreement to create an informal Producer In-Kind residency whereby participants host one other—providing accommodation or office space—to help make international projects more viable. Korean independent producer Sounghyo Ryu invited Campers to collaborate in developing an independent producer residency and festival in Korea’s southern city of Busan. The idea is to match international producers with local producers and artists developing site-specific work within the broad theme of city rehabilitation, architecture and space. It’s early days—and highly funding-dependent—but at the time of writing several participants are already involved. During APPCAMP’s intensive week of talking, bonding, networking and skill sharing, what struck me beyond the wealth of experience and engagement in the room was the critical mass enjoyed by Asia’s comparatively large populations and high-density cities. Seoul’s Daehakro Daehangno theatre district alone boasts around 140 small and medium sized theatres, for example; such scale, extrapolated across participant countries, means enormous potential for developing innovative independent projects in specific locations. Over the coming three years APPCAMP participants will continue to explore each other’s creative landscapes, meeting next in Taiwan in late 2015. New Zealand will join the network this year, with further countries following. Friendship, as organiser Fenn Gordon reiterates, will remain key. In Korea, I learn that, ‘traditionally,’ those who witness winter’s first snowfall together will have a long and happy relationship. If ‘tradition’ is anything to go by, things are looking good for APPCAMP 2015 and beyond. Melbourne-based writer and artist Urszula Dawkins attended APPCAMP as an observer. You can follow her blog at lightblue.com.au. This article was commissioned and the writer funded by RealTime. Air travel and accommodation were provided by APP. Find out more about APPCAMP and its participants at: asianproducersplatform.com. RealTime, a print and online magazine focused on Australian and international innovation in the arts, can be found at www.realtimearts.net. RealTime is published by Open City Inc which is supported by the Australia Government through the Australia Council for the Arts, its funding and advisory body, and Arts NSW. The Asian Producers’ Platform was founded in 2013, spearheaded by non-governmental organizations from four countries: Steering Committee for the Producer (South Korea); Performing Lines, and Live Performance Australia (Australia); Performing Arts Alliance (Taiwan); Open Network for Performing Arts Management (ON-PAM, Japan). Its main objectives are developing networks among the producers from Asian countries, seeking ways to expand their creative producing activities, widening the possibility of intercultural activities, and fostering the development of creative leadership within each country and over Asia. 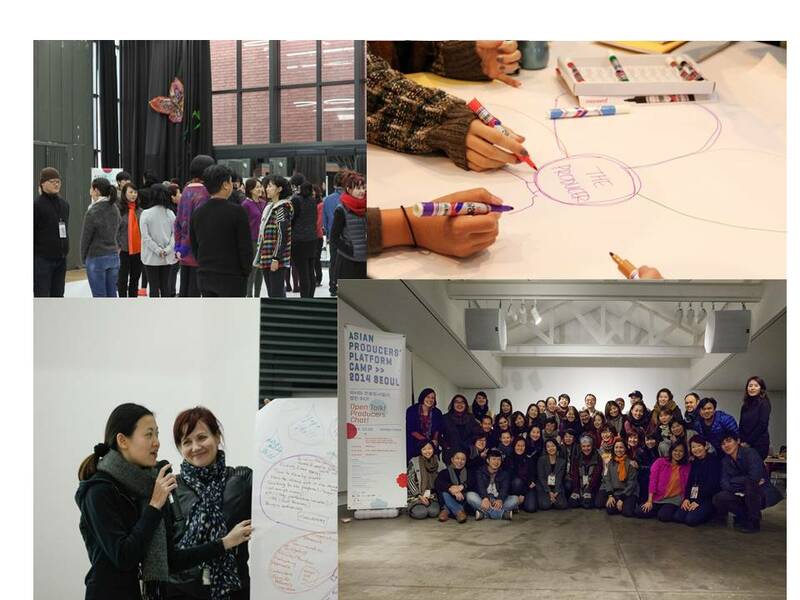 In December 2013, producers and artists from the four countries gathered in a conference titled "The Producer" in Seoul and in December 2014, 40 producers from Asia joined the first APPCAMP. APPCAMP 2015 will be held in Taiwan from November 29 to December 6.